Does Joba Belong in the Pen? The New York Yankees pulled out a late inning victory today with a lot of help from the Captain’s first homer at his new digs. The win was the first at the stadium 2.0, and was the first win that showed the 2009 Yanks won’t necessarily roll over and die in tight games. One major cause for concern, though, was the performance by Joba Chamberlain. Joba was only able to go 4 2/3 innings and struggled to get that far. Joba had 5 walks and just 4 strikeouts. Even scarier, of 93 pitches, he only threw 46 for strikes. He’s throwing on 56% of his pitches for strikes in his first two starts, and batters aren’t swinging and missing at the rate they had in the last two years. He’s averaging 5 walks and 8 hits per nine innings, and opponents are hitting .250 off him, but more importantly, they are reaching base 37% of the time. But who cares? We are two starts in, he’s kept the Yanks close in two starts and his breaking stuff still dives and darts. The problem with Joba is that the New York media is stupid, and there will be murmurs saying move Joba to the pen. By these standards, move Chien Ming Wang to the pen. Joba’s past success as a setup man will doom him at this point, and only further pressure him to perform as a starter. The Yankee’s pen has struggled a little, but not in the role that Joba would take over. Brian Bruney has been filthy in his last few outings. If you discount Bruney’s first outing, he has pitched 5 2/3 innings, walked none, allowed no hits, and struck out 12. All this on 66 pitches. The Steinbrenners will be begging to make him a starter soon. Also, Joba’s velocity has been down in the low 90’s early this year. It has been slowly climbing since the spring, but if he can’t hit 95, he won’t be effective out of the pen. If he doesn’t figure out his control as well, he would be a complete headache in late innings. Joba should stay a starter. He will figure his control out, and velocity will slowly come back. With Chien Ming Wang as yet, ineffective, it would be too costly to lose another starter. Would fans really rather have Phil Hughes in there? One of the starters will get injured and that’s when Hughes will make his presence known(or fail miserably like he has in the past). So Yankees fans, relax. Old Joba will be back soon, and order will be restored to the Holy Yankee Empire. The real concern should be in the right arm of Wang, who has given up more than 3 hits per inning and whose sinker has shown little, if any life. A great ball player, a great man, he was still out here, though. Sixty two years ago Jackie Robinson started a fight that benefited everyone in American society and much of the world. You can argue that Robinson’s breakthrough in baseball was as crucial as most points in the civil rights movement. Like Jesse Owens before him, Jackie Robinson was a quiet, honorable man on the field, and that made it hard for fans to dislike him (though most found ways, for a long time). But today, the thing this great man fought for, baseball, is no longer desirable in this country. Jackie would not be disappointed in African Americans specifically, but everyone when it comes to baseball. Baseball has become somewhat of an elitist game. The age of the Sunday pickup game has given way to the tournament weekend in Tennessee, and much of the fun has gone with it. You must dig deeper to find the cause. The lack of freedom of the American child has a lot to do with it. Many people seem to think their kids are freer today than they ever were, but think a little harder. Kids today don’t leave the house. They play videogames or find kids with funny names on facebook. When kids do venture out into the great unknown it is for a formal sports practice or a scheduled playdate. Now, I hate to sound all Wilford Brimley on you here, but when I was younger (born in ’85, not that long ago) we were barely allowed in the house. There is a general fear among parents of child abduction or sexual predators and whatnot, which their child may have a better chance of finding online. There are no longer really public fields as well. Sure, they exist, but there is always some type of practice going on. Baseball training has become work. You think this is how Rizzuto learned? How many kids play an instrument when they are younger? In my region at least half, but within a couple of years most of them quit. Why? Because it is work. All they see is notes, and there is not much fun in that. Baseball has become somewhat of the same experience. Also, Compared to other sports, baseball is difficult to pick up. From one of my top 5 films, “It’s the hard that makes it great,” but its also the hard that makes kids quit after a year or so and pick up soccer. I will get to soccer in another article. AAU has replaced any local pride a kid had in his youth and Legion teams. AAU has also priced out much of the best athletes. It provides the best exposure for players and therefore gives kids who can’t afford it a hopeless feeling, and sets their future in the sport in stone. In Baseball today, the coaches or scouts don’t come to you, you have to go to them, and in many cases, you must pay for this, too. It is bad enough the bats cost three hundred bucks, a decent glove $150, and new spikes $75. A season of baseball could easily cost a 13-yr old kid $5 grand these days. I would also argue that the baseball in Robinson’s day was better. Many argue that the players are faster, stronger, and in better shape, but does that make for better baseball? For a while, homeruns made us forget what a hit and run, double steal, and sacrifice bunts were. Through the nineties, baseball players were 6-4, 220 lb weight lifters with very little athletic ability. Look at Joe Dimaggio, Phil Rizzuto, Pete Rose, Hank Aaron, and Jackie. These guys were great athletes who got good at baseball playing with their friends. Not in some academy. Others argue that the best players are produced in academies. The academies they speak of are in the Dominican Republic, though. My response to them is that the alternative to the academy there is not pretty, and they understand the spirit of baseball because of that. Baseball, a game, can get them out of poverty. That is how baseball was for a long time here. But, alas, the sandlot has made way for the state of the art practice batting cages for kids 10-12 to hone their skills with video to show them the flaws in their changeup grip. It is good to see smaller guys making their way in the MLB. And its good to see that only a few guys put up massive home run numbers last year. Maybe the game won’t scare off as many kids. As the WBC showed us, baseball is far better in other countries. Baseball is becoming a sport where all Americans are the minority. Why Are the Browns Dying to Trade Braylon? 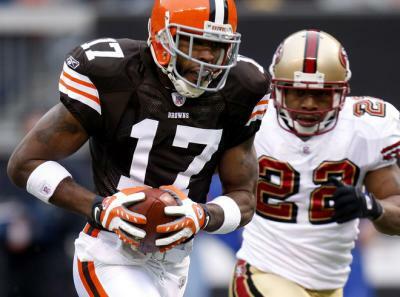 The rumors are circulating that the Cleveland Browns are aggressively shopping number one receiver Braylon Edwards. Why? The 26 year-old receiver is an unrestricted free-agent at the end of the 2009 season and they are leery of their ability to resign him. It is reported that Edwards wants a contract paying him $10 million per year or more. The Browns are said to be demanding 1st– and 3rd– round picks as a base to any Edwards deal. The New York Giants are said to be the team hottest for Edwards and it’s no secret why. They’ve cut former number one receiver Plaxico Burress, after struggling to renegotiate a new contract with the troubled player. When the Giants lost Burress last year after the notorious gun-in-sweatpants incident, which ended with Plax with a bullet hole in his thigh, they were not the same team. They are in dire need of a big, fast receiver for Eli to under throw down the field. The reason for Cleveland’s interest in trading Edwards is not enough to make sense. They aren’t sure that they can resign him at the end of the year? There are 2 issues with this excuse. The first issue is that Cleveland can always use the Franchise tag on the star receiver next year. While it is not a perfect way to settle the issue, it is an option that will allow them to keep the player. The second issue is that they can Franchise the player and trade him for picks then. For a team that is short on star power and is set to have a quarterback competition in trading camp, does it make sense to trade the best player on your team? Trading a bona-fide number one receiver, with a career 16.0 ypc, is not a way to build a successful team. Beyond Edwards, Cleveland has second year player Syndric Steptoe and newly signed David Patten as the players following Edwards on the depth chart. That is not inspiring for a team that is trying to be competitive. Trading Edwards is not giving either of your quarterbacks a legitimate shot at succeeding in 2009, especially after trading tight end Kellen Winslow for a second round pick earlier this offseason. The Brown, headed by new head coach Eric Mangini, would surely draft Edwards replacement in the upcoming draft, as they currently have the 5th overall pick and two 2nd round picks (among others) and would be adding another 1st and 3rd to their pile. But as we’ve seen in the past, drafting players is no certainty of success, let alone that there is no guarantee that the desired player is available when you are drafting. Furthermore, rookie wide receivers face one of the steepest learning curves for incoming players, due to the complexity of pro-style offenses, timing of routes, and the increased skill of opposing corners. So there isn’t a certainty that the receiver that Mangini drafts will succeed. And after witnessing some draft flops he’s had in the past (Vernon Gholston anyone? ), the Cleveland brass should be weary of trading a proven commodity. And given the negative perception Mangini has around the league, signing free agents in the future is no promise either. Successful teams in the NFL don’t trade away proven players and improve. Rather, they take a few steps back and there is no telling if they will be able to compete in the future. The Browns need to keep Edwards for the 2009 season and draft to improve a bottom-feeding defense. Then, after the season, they should take stock in what their needs are and address the Edwards situation accordingly. Rushing to make a deal for the sake of making a deal is not a good way to run a business. But then again, hiring Eric Mangini to steer the ship wouldn’t be they way I run a business either. Good luck Brown fans, as the future is not looking too bright for you now. The NFL network is currently dealing with two major cable providers. DishNetwork and the network settled on a deal that would keep NFLN on their second tier 200 channel lineup after it was demoted to that status for breach of contract (they simulcast the pats-giants 16-0 game a few years back. big whoop). The network is now locked up in a legal fight with Comcast. Comcast refuses to move NFLN from their sports package into one of their digital lineups. Comcast says that the 70 cents per viewer NFL charges is simply too much for a channel they believe caters to a small demographic. As a spectator, it looks more like Comcast uses the network to try to get people to buy their Sports Package. If Comcast wants people to buy their sports entertainment package then why don’t they include all the dedicated sports channels in it? The answer is pretty simple: because if they included MLB network, ESPN classic, ESPNews, and the Golf Channel on the sports entertainment package, then many would drop the digital classic package. This is because without the sports channels, the digital classic (aka digital preferred) package is borderline unwatchable. This is a package that includes such great channels as: SoapNet, Style, Toon Disney, VH-1 Classic (if you missed Rock of Love last year), Fox reality, and WE. I understand that these channels have viewers, and I’m not trying to say these viewers have bad taste in television, but I do believe NFLN has more of an audience than MTV Jams. The Digital Preferred package just seems like one that Comcast gets for cheap. In turn they charge the viewers through the teeth even though they probably picked up the package for one or two channels. Without MLB network, Hazel Mae is but a distant memory for many New England viewers. The fact that they throw MLBnetwork on with the digital classic package is even more infuriating. The network was originally promised to be a basic cable channel and is a digital basic with many cable providers. With Comcast, this is not the case. Comcast has found a way to make sports fans have to order both their digital preferred and their sports entertainment packages to feed even the smallest fix. The preferred package is nothing without the sports channels, and the Sports package would lose a majority of its subscribers if they lost the NFL network. This is not even to mention that ESPNU is not even available on Comcast which has burnt Uconn fans for years now. My advice to Comcast: help the consumer out and throw the sports channels on the Sports package. My advice to the sports fan: switch to the Dish Network. You are currently browsing the The Blue Duck blog archives for April, 2009.